Growing up in a small town in western Michigan, Betsy was itching to see the world. Determined to go east for college, she fell in love with the Purple Valley on a spring break road trip. Just as she had hoped it would, Williams broadened Betsy’s horizons. She studied Russian language, literature, and history and studied abroad in Soviet-era Moscow. After college, she worked as an investigative reporter for a Chicago newspaper and then as an organizer and press secretary for Michael Dukakis’ presidential campaign before pursuing a career in law and public policy, earning an MPA from Princeton and a JD from Yale Law School. When her partner, Steve Pomper, had an opportunity in Brussels, Belgium, Betsy jumped at the opportunity to expand her horizons once again. 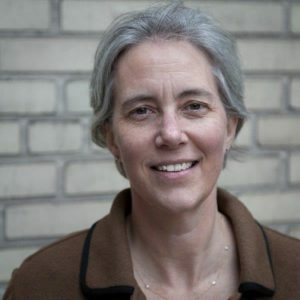 During three years abroad, Betsy worked first as a law clerk at the International Criminal Tribunal for the former Yugoslavia in The Hague and later as a Fulbright Fellow and researcher in the Brussels office of Human Rights Watch, where she documented the detention and mistreatment of refugees and asylum seekers throughout western Europe. Betsy stayed with Human Rights Watch for eight years, ultimately directing its Europe & Eurasia division, before taking other roles in international nonprofit management. Eventually, Steve and Betsy made their home in Washington, D.C., where they have raised three children—Anna (’18), Nick, and Charlie—and built careers in international law, human rights, and development. Betsy is currently the Executive Director of the World Justice Project, a non-profit that works to advance the rule of law, good government, and human rights through research, advocacy, and support for a global network of reformers and activists. She has been honored for her work on human rights with a number of awards, including a Williams Bicentennial Medal (2006). Her 2006 convocation address, “The Field is the World,” celebrated how Williams gave her the world as a field of study and work. In addition to her service to Williams as a term trustee since 2013, Betsy has been vice president of her class and an associate class agent. She remembers well how Williams alumni helped her find her first job out of school and enjoys paying forward that favor, regularly serving as an advisor and mentor to students and young alumni.